Mr Mustard reads a lot of tribunal decisions, usually about 300 a month (sat in bed with his ipad and a cup of tea in the morning, bliss). He missed this one though and a vigilant reader brought it to his attention. Adjudicators, being trained lawyers of at least 3 years call (qualified working time) tend to employ intelligent & indirect criticism. The most critical phrase Mr Mustard had seen up until now was 'This is an astounding decision' which was in relation to car drivers being expected to check the internet to see if there was a rugby match taking place that day rather than being notified by signs. Mr Mustard simply hasn't seen such a direct slap around the face with a wet cod nor such a warning to never say something again nor the use of the word 'nonsense' which leaves so little doubt about the concern for legality and procedural fairness in the mind of the adjudicator. What worries Mr Mustard is that this is unlikely to be a one off event. Other people may have taken the council at their word, which we all should be able to do, but which Mr Mustard never accepts without verification, and paid the PCN for a car which was not theirs, an absolute miscarriage of justice. Mr Mustard has noticed over the years that Barnet Council are more stubborn than most councils when it comes to accepting that cloning has taken place and it does happen a lot. When Mr Mustard gets a cloning case it is often the case that the car will incur penalties in more than one borough and drive away without paying for fuel. Other local authorities have proven themselves to be impartial and objective when it comes to accepting that cloning has taken place, not to Barnet Council, who insist motorists go to the tribunal even when faced with evidence from the DVLA, police and other authorities who have cancelled their PCNs. Mr Mustard doesn't know why they are stubborn in this area. The above extract of a tribunal decision (number 2170150147 for experts who want to know) contains an important principle, the council have to prove that it is your vehicle. The registration plate does not make it your vehicle, just a vehicle bearing the number plate that has been allocated to a particular metal box. 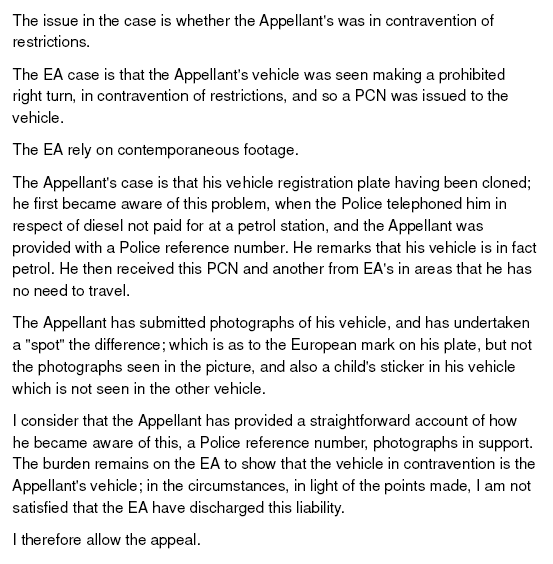 Best produce everything to the tribunal though that shows it isn't, starting with a 'spot the difference' set of photographs and prove you have told the police or DVLA of the cloning. When you tell the police they stick the number plates into their vehicles of interest database and keep stopping cars with that plate until they catch the rogue one. Another massive loan being voted on. Tilling Road - Barnet Council get it right! Reject but then accept the same argument - why?